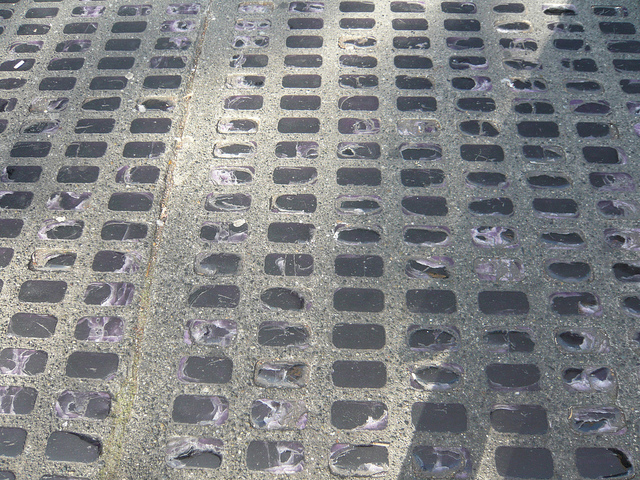 If you walk around Vancouver’s older parts of town you might stumble upon some beautiful stretches of sidewalk where pieces of purple glass are embedded in the pavement. This is not just sidewalk décor, but rather an architectural system of lighting known as vault lights or sidewalk prisms. The glass tiles were designed to provide lighting to subterranean spaces through the use of prisms, which angles the light into these underground chambers and diffuses it evenly throughout the space. The idea originated as deck lights, which were used on ships to let light below the decks without the use of candles or lanterns, thus reducing the risk of fire. 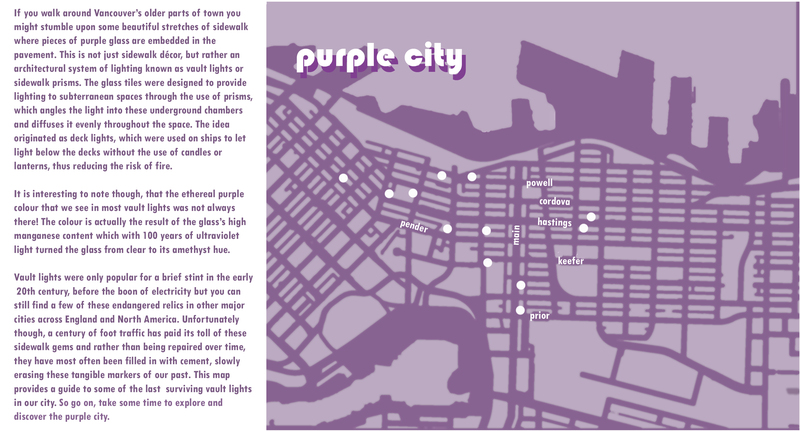 Perhaps Vancouver’s Great Fire is the reason there are so many of these purple jewels in the city? It is interesting to note though, that the ethereal purple colour that we see in most vault lights was not always there! The colour is actually the result of the glass’s high manganese content which with 100 years of ultraviolet light turned the glass from clear to its amethyst hue. Vault lights were only popular for a brief stint in the early 20th century, before the boon of electricity but you can still find a few of these endangered relics in other major cities across England and North America. Unfortunately though, a century of foot traffic has paid its toll of these sidewalk gems and rather than being repaired over time, they have most often been filled in with cement, slowly erasing these tangible markers of our past. So if you get the chance, take some time to walk around Vancouver’s historic neighbourhoods, such as Gastown and Chinatown, and you will be sure to stumble upon a few of the last surviving vault lights.